For the potato salad, half-fill a pan with salted water and bring to the boil. Add the potatoes and return to the boil. Cook for 15-18 minutes, or until just tender. Drain in a colander and then rinse under running water until cold. Mix the mayonnaise, crème fraiche, capers, gherkins and lemon juice in a large bowl until well combined. Cut each of the potatoes into four chunks and stir into the mayonnaise dressing with the lemon zest. Season, to taste, with salt and freshly ground black pepper. Sprinkle over the parsley. For the pork schnitzels, sandwich one of the pork loin steaks between two sheets of cling film. Flatten the steak using a rolling pin or meat mallet to an even thickness of 1cm/½in. Remove the cling film and cut the flattened steak in half lengthways. Season on both sides with salt and freshly ground black pepper. Repeat the process with the remaining pork loin steaks. Beat the egg in a bowl. Sprinkle the flour onto a plate. Mix the breadcrumbs, lemon zest, parmesan, thyme and a good pinch of salt in a shallow bowl until well combined. Dredge each piece of pork first into the flour, then dip it into the beaten egg, then dredge it in the breadcrumb mixture until completely coated. Repeat the process with the remaining pieces of pork. Add two of the schnitzels to the pan and fry for 2-3 minutes on each side, or until the pork is cooked through and the coating is crisp and golden-brown. Remove from the pan using a pair of tongs and set aside to drain on a warmed plate lined with kitchen paper. Keep warm. Repeat the process with the remaining two pork schnitzels. To serve, divide the potato salad among four serving plates. Arrange a few watercress leaves alongside each portion and drizzle with a little olive oil. 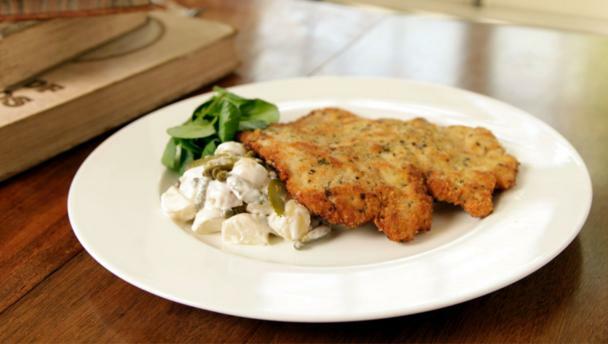 Lay one pork schnitzel alongside.